ADaM Asset Management provides the perfect system for managing, monitoring and maintaining your companies assets. The system can be used simply for managing an asset register, a catalog of all your assets or quite powerfully for managing every detail of your assets from scheduling preventative maintenance, routine administrative dates, and attaching important documents. 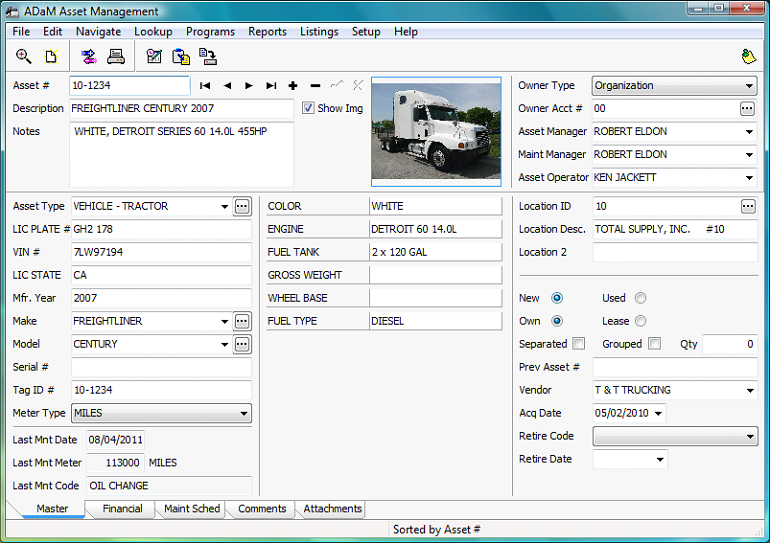 The Asset Management system allows for unlimited descriptive information as well as user defined detailed information. Attach documents and images for viewing at the touch of a button. You can also import maintenance or fuel data from an outside source. Financial 'book' for cost basis, depreciation schedule, lease info, etc.